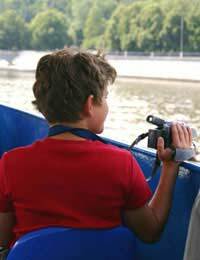 Whilst many amateur home movie makers make the fatal mistake of moving with the camera in the wrong way there are correct procedures to moving with your camera which can give your video dramatic effect. However, it’s important that you understand the different techniques that the professionals use and to practice using them. Primarily, there are 6 main techniques which professional film makers employ. They are the pan, tilt, dolly, truck, arc and pedestal. The pan and tilt methods are probably the two most common movements with your camera and you’ll have no doubt adopted these techniques already, perhaps without even realising it. In both of these, it’s the camera that moves and not you personally. In panning, the camera moves from side to side, whilst with tilting, the camera moves up and down. These two techniques differ from pan and tilt movements in that they both involve you physically moving with the camera. To ‘dolly’ means that you are physically moving with the camera backwards and forwards whilst to ‘truck’ means the same movement from the left to the right and vice versa. In the professional world, the equipment which is generally used to perform both of these actions is called a ‘dolly’. It looks like a tripod on wheels. When you dolly and truck at the same time, this technique is known as ‘arcing’. In actual fact, it means that you are moving around your subject in a semi-circular motion. You’re likely to have seen dollies rising and falling when you sometimes catch a glimpse of them on live broadcast programmes. It involves altering the camera’s trajectory so that the result is one of looking at the action from below or above where it is taking place. This is known as the ‘pedestal’ technique. By observing TV programmes and films and identifying where and when one or more of these 6 techniques are used, it will help you build up a picture of the kind of situations when each movement is deployed. This will then increase your capacity to use the same techniques at the appropriate moments in your home video which will enable you to add dramatic effect to your filming. It is all about practice, however, and by looking back over your footage following a shoot, you’ll naturally be able to tell what worked and what didn’t and it’s by doing this regularly that you’ll hone your technique until it soon becomes second nature. Even if you can’t afford a dolly, it’s amazing what you’ll be capable of achieving with your own body combined with a sense of imagination and creativity. You can start to shoot a scene from a squat position with your knees bent and then slowly rise up, standing straight to create an effective shot, much in the same way as you would with a dolly. Whilst there are all kinds of equipment you can buy to make your home videos look even more professional, sometimes it’s going to be necessary for you to improvise. However, like all good filming techniques, the movements outlined here take months, if not years, of practice and a lot of trial and error to get it right every time.